Messy Systems acknowledges that moving our society toward resilience is not a new endeavor, nor is it a neat one – it does not require us to be well-mannered, ordered, or even in full agreement. It does mean we will need to work together to find, reinforce, and – in some cases – adapt or remake the systems and processes by which our communities and broader environment are shaped and managed. 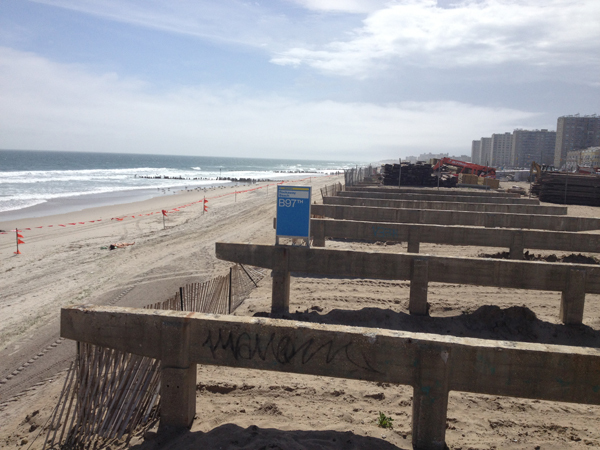 Boardwalk supports at 86th St. beach, Rockaways, Queens, NY await a replacement following Hurricane Sandy. Photo by Dave Hampton. This weblog is an outgrowth of the U.S. Department of Housing and Urban Development-sponsored Rebuild by Design competition launched in summer 2013. Contributor Dave Hampton assembled a team of people from different disciplines to tackle the complex challenge of finding ways for communities along the East Coast of the United States affected by Hurricane Sandy recover in a more resilient way, and to develop scalable strategies to allow other communities still to be tested by disaster or environmental change. The central ideas were very motivating for us, of course. But for me, personally, the people were the real draw. Some I knew from my time in Haiti. Some were recommended by other team members. Some I came across by happenstance. The more I learned about these folks – their views on things, the work they had done or were currently doing, what motivated them – the more they fascinated me. When we weren’t shortlisted, I was disappointed, of course. But, I thought, for these great people to just go back to their business and lose that initial energy and momentum would be even worse. The motivation for Messy Systems was also a bit selfish: I simply wanted an excuse to keep hanging around and experiencing these cool and fascinating people. I wanted not only to be present as they examined the most critical issues of our time, I wanted to help be a catalyst for ways of addressing them. Hopefully, Messy Systems is is a start. We are proud to bring together an exciting array of contributors, thinkers / teachers / advocates / working professionals… often found in the same person. Because the issues at hand require, by definition, a broad range of multi- and cross-disciplinary thinking, training, expertise, and experience, our contributors come from the fields of engineering, architecture, landscape architecture, urban and regional planning, environmental law and policy, data visualization and information management, disaster risk reduction / management, finance and risk management, geography, anthropology, and the social sciences. Note: if you’re interesting in contributing, please contact us below. The intent of this weblog is to provide a sounding-board for ways in which communities might deal with risks and recast them into opportunities for a more resilient future. At times, a contributor may act as curator, by provoking, encouraging, cajoling, bribing, poking, prodding, or otherwise strong-arming other contributors to respond to a timely news item. Other times, contributors will follow their conscience and report on a topic or event which is important or critical in their view. Or, a contributor may share what they are currently working on and how they are advancing toward the goals of resilience. Occasionally, contributors will interview each other, or collaborate on a piece. Maybe we’ll invite guest contributors as the story dictates. Our hope is that, rather than pre-determine what will be addressed here and how, a trajectory will emerge – a storyline – and content will be developed which is relevant (and interesting) to educators, policymakers, practitioners, potential clients, and the general public. We hope you’ll join us for the journey.